This article is about the city. For the river, see Marikina River. Marikina, (/mərɪˈkɪnə/), officially the City of Marikina, (Tagalog: Lungsod ng Marikina), or simply known as Marikina City, is a 1st class highly urbanized city in Metro Manila, Philippines. According to the 2015 census, it has a population of 450,741 people. Founded by the Jesuits on the fertile Marikina Valley in 1630, Marikina was the provincial capital of the Province of Manila under the First Philippine Republic from 1898 to 1899 during the Philippine Revolution. 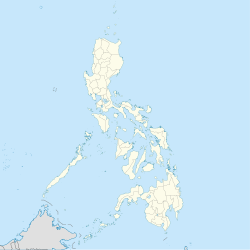 Following the onset of American occupation it was then organized as a municipality of Rizal Province, prior to the formation of Metro Manila in 1975. A formerly rural settlement, Marikina is now primarily residential and industrial and has become increasingly commercial in recent years. The City of Marikina is considered one of the wealthiest local government units in the Philippines. Marikina is known as the "Shoe Capital of the Philippines" for its famous shoe industry. It is the biggest manufacturer of shoes in the Philippines, producing almost 70% of shoes made in the country. Located in the city are the Philippine International Footwear Center and the Shoe Museum, housing the infamous shoe collection of former First Lady Imelda Marcos, wife of the late Filipino dictator Ferdinand Marcos. The city is under the jurisdiction of the Roman Catholic Diocese of Antipolo. It contains the Our Lady of the Abandoned Church, the oldest in the Marikina Valley. One of the builders of the Jesus dela Pena Chapel was a young priest named "Mariquina", who was given the task of baptizing children to Christianity. Because of this very noble job, Mariquina was named in his honor. It is said that before the Spaniards came to Mariquina, a beautiful, virtuous, polite and intelligent lady named Maria Cuina was residing in the town. Because of her expertise in business, she became wealthy, and her fortunes were expended in charity. She eventually became famous in the whole town up to Manila. Construction of the chapel of Jesus dela Peña was supervised by a Jesuit priest, and the laborers were Filipinos. As expected, the language barrier resulted in the usual misunderstandings. When the chapel was completed and the priest asked what the structure would be called, one worker answered "Marikit-na-Po", thinking that what was being asked was the condition of the chapel. In the province of Nueva Viscaya in Spain, there was a beautiful town called Mariquina. The town, located beside the Charmaga River (now known as Artibai River), is the origin of the Jesuit priests who came to the Philippines and established Jesus dela Peña. Because of this, "Mariquina" was used to honor the place where they came from. In 1901, Commissioner de Tavera changed the letter "q" to "k". The total land area of Marikina is approximately 21.5 square kilometers (km²) or 2,150 hectares (ha). This represents about 3.42% of the total land area of Metro Manila. At present, the city is composed of 16 barangays. Barangays Fortune, Concepcion Uno and Marikina Heights are among the largest in terms of land area. The south portion of the city comprises numerous commercial, industrial and residential areas, heritage sites and mixed use zones, while the north and northeast portion are primarily residential and industrial zones, and various establishments such as small and medium enterprises. Loyola Grand Villas, located at the northwest portion of the city, is a gated community comprising upper-middle class and wealthy residential areas. Barangay Sta. Elena represents a poblacion, or the center of Marikina. At present, it comprises 38% residential, 19% commercial and industrial, 17% Roads, 8% Mixed-use, 18% for parks and open spaces, development areas, institutional, cemeteries and others. Located along the eastern border of Metro Manila, it is bordered on the west by Quezon City, to the south by Pasig City and Cainta, Rizal, to the north by San Mateo, Rizal and to the east by Antipolo City, the capital of Rizal province. It is approximately 21 kilometers away from Manila and lies within 14°38′24″N 121°5′50″E﻿ / ﻿14.64000°N 121.09722°E﻿ / 14.64000; 121.09722. From the north, Marikina occupies most of the south bank of Nangka River. The east slices at the foot of the Sierra Madre mountains of Antipolo and sliced by the streets of Montserrat Hill, Bonanza and Starlite in Barangay Concepcion Dos. The southeast slices by Sapang Baho River occupies the north-west bank. The south portion is sliced by Marcos Highway and occupies most of the north side of the highway and extends to the west until it occupies the Line 2 Santolan Station depot until it reaches the Marikina River. The east occupies the southernmost of Quezon City hills which lies in Barangay Industrial Valley and sliced by C5 Road occupies the west side until it reaches Ateneo de Manila University campus. The east part of the campus covers the city, extending to the north and sliced by several roads of Loyola Grand Villas, which covers the east part of the village until it reaches Marikina River and its tributary Nangka River to the north. Marikina is prone to various natural disasters, including 2009 Typhoon Ketsana, and seasonal southwest monsoon such as 2012, 2016 and 2018 floodings. Primarily, flooding within Marikina is caused by the increase of water level in major rivers and its tributaries, followed by overflowing from its riverbanks to low-lying areas throughout the city. Marikina features a tropical monsoon climate. Its proximity to the equator means that the temperature range is very small, rarely going lower than 18 °C (64 °F) or higher than 38 °C (100 °F). However, humidity levels are usually very high, which makes it feel much warmer. It has a distinct, relatively short dry season from January through May, and a relatively lengthy wet season, from June through December. In 1787, the town was called "Mariquina" after Felix Berenguer de Marquina, who was the governor-general at that time, and the town was declared a pueblo under the Spanish colonial government. By the 19th century, Hacienda Mariquina was owned and administered by the Tuason family and had become the largest in the Philippines. The hacienda was declared a mayorazgo by the Spanish colonial government. Don Juan Gregorio became the first Alcalde Capitan of Mariquina in 1822. On June 11, 1901, shortly after the United States took possession of the Philippines, its name officially became "Marikina". The province of Rizal was created by virtue of Act No. 137 by the First Philippine Commission which was acting as the unicameral legislative body in the island of Luzon. Marikina, along with many other towns around Manila, was incorporated into the new province. In 1906, the Manila Railroad Company completed a 31-kilometer steam train line called "Marikina Line", also known as Rosario-Montalban branch, a branch of Philippine National Railway which is currently existing (converted into the road which is known today as Daang Bakal, including Shoe Avenue), Marikina Railway Depot (Marikina Elementary School in the present-day) and Marikina Railway Station, connecting Montalban and Rosario (known today as Tramo, in Pasig). Marikina Bridge, a vital economic link to Manila, was formally opened in 1934. During the construction of the train line, not far from Marikina Railway Depot, Marikina Airfield was completed and used for civilian airfield. The runways were subsequently converted into the road known today as E. Rodriguez Avenue and E. Santos Streets, and the airfield stands today as Paliparan Subdivision. In 1936, the train line was completely abandoned, while the airfield became primarily used by the Japanese during World War II. After the war, neither was rebuilt. In 1956, Marikina had re-emerged as a town of shoemakers after World War II. Honed by years of shoe manufacturing experience, the natives had developed a work ethic that prepared them for the arrival of heavy industries, and the town was finally named as the "Shoe Capital of the Philippines". With the industrial plants came waves of workers who chose to stay, rapidly increasing the population. In 1968, Kapitan Moy's house (now known as Sentrong Pangkultura ng Marikina) was declared a national shrine by the town council and the National Historical Commission. In 1969, Rodriguez Sports Complex, known today as Marikina Sports Center was completed. On September 26–27, 2009, Marikina was widely devastated by a flash flood from the overflowing Marikina River, due to torrential rains caused by Tropical Storm "Ondoy" (Ketsana). The river reached the 23-meter mark, the worst flooding in two decades. The city was declared under state of calamity, as flood water flowed throughout the towns and barangays. National and international aides arrived immediately for relief, retrieval and recovery operations. The native people in Marikina refer to themselves as "Marikeño" (or Marikenyo, in Filipino). The population of Marikina is near half a million, making it one of the most densely populated areas in the Philippines. Like other places in Metro Manila, the original settlers are Tagalog. There has been a constant migration of other ethnic groups in the Philippines. Tagalog is widely spoken and the main language in Marikina, while English is used in education and business. Marikina is the biggest manufacturer of quality shoes in the Philippines. It is also the Philippines' largest worldwide exporter of leather shoes that tagged Marikina as the Shoe Capital of the Philippines. Hundreds of footwear establishments are located throughout the city, generating thousands of jobs and city financial resources that continue to make the shoe and leather industry the top livelihood in the city. By the 2000s, the Marikina shoe industry was affected by competition from Chinese manufacturers. The financial resources of Marikina is scattered all over the city, but the southern part is primarily concentrated which includes business establishments and commercial facilities, while the northern part is factories and warehouses. Riverbanks Center is the city's commercial center situated southwest of the city where shopping malls and recreation areas are located. Real estate, commercial developments and numerous commercial establishment along Marcos Highway and Sumulong Highway are developing. Restaurants, cafés, diners and entertainment bars are concentrated in Gil Fernando Avenue, J. P. Rizal Street, Bayanbayanan Avenue and Lilac Street. Dubbed as Marikina Market Mall, Marikina Public Market is a centralized modern market and an attraction for shoppers with a mall-like ambiance. The market is divided into two sections: the dry goods and the wet goods. Commerce in this market is active mostly during early mornings and late afternoons. There are also food stalls and eateries located inside the market. Some of Marikina's local products are handicrafts, sweet delicacies, leathers, clothing, food processing, bags, accessories, and footwears. SM City Marikina is currently the largest shopping mall in the city, while Riverbanks Center, a community shopping complex situated near Marikina River is a popular outlet store in the eastern Metro Manila region. Other shopping malls located in the city are Blue Wave Marquinton Mall, Graceland Plaza, C&Ps Circle Mall and Ayala Malls Marikina. Other shopping centers located along Marikina-Infanta Highway are Sta. Lucia East Grandmall, Robinsons Metro East, Ayala Malls Feliz and SM City Masinag which are more closely to Marikina than to their respective city proper. Like in other city governments in the Philippines, Marikina is governed by a mayor and a vice mayor elected to three-year terms. The mayor is the executive head and leads the city's departments in executing city ordinances and improving public services, along with city councilors, while the vice mayor heads a legislative council, and these councilors represent the two (2) legislative districts of the city. The council is in charge of formulating and enacting city ordinances. The official seal of the City of Marikina bears the inscriptions "Lungsod ng Marikina", "Pilipinas", "1630" (the founding year of the municipality), and "1996", the year of approval of the city charter. The two mountains represent the majestic twin ranges of the Cordillera and Sierra Madre, between which the Marikina Valley is nestled, traversed by the Marikina River. The rising sun points to the eastern location of the city, with each ray representing the city's barangays. The machinery gear symbolizes its industries and the shoe last represents the traditional manufacturing in the city. The torch focuses on the lofty and noble ideals for human development and a better quality of life, and is symbolic of its Hispanic culture and tradition. The bamboo underscores a mixture of the people's natural humility and strength of character and also emphasizes the city's transition from an agricultural past to the urbanized, industrial present; the leaves and branches symbolize order and serenity. The bamboo and the wheel represent Marikina and its people's respect for and protection of the environment so as to remain in harmony with progress. Local cuisines such as Everlasting, a popular dish in Marikina similar to embutido but it is cooked in "llanera", Waknatoy, a unique dish is simply a variant of Menudo with addition of pickles which gives waknatoy a sweet-tangy flavor and Laoya, a dish similar to Nilaga with addition of pounded garlic, sweet potato and banana (Saba). Lilac Street in SSS Village includes a strip of restaurants featuring food from different parts of the world with the likes of Singaporean, Japanese, Thai, American, and Filipino Cuisine. The local government of Marikina recently[when?] hosted a Food Festival to promote this part of town. Marikina's festivities is rich in culture, tradition and the people itself. The traditional dance in Marikina is Lerion, the official folk dance of Marikina. The stadium is also home to the JPV Marikina F.C., a football club which currently plays in the Philippines Football League, the premier football league in the Philippines. Like in most of the urban areas in the Philippines, is facilitated mostly using inexpensive jeepneys. Buses mostly in highways, tricycles give access to more secluded areas like villages and subdivision, while taxi cabs are available throughout the city. Tamaraw FX has begun to compete directly with jeepneys in major roads while UV Express Shuttle services are also available in selected terminals. In January 2016, the city government of Marikina invented the "AMV" or "Adaptive Mobile Vehicle" for the PWD or Person with Disabilities and Senior Citizens. The "AMV" is wheelchair vehicle or can put wheelchair inside. The local government of Marikina wants to be a "friendly city" for the Senior Citizens. A bike lane was introduced in 2012, this time beside major highway like Marcos Highway, running from Santolan station of Line 2 up to Imelda Avenue. Line 2 runs through the city and the current elevated railway station is Santolan, located along Marcos Highway, between the border of Barangay Calumpang in Marikina and Barangay Santolan in Pasig. The station connects to the west-end, Recto station, along Claro M. Recto Avenue in Manila. By year 2020, the currently under construction Emerald station serves the area of Barangay San Roque and nearby areas and this will be the line's second station runs through the city. The station connects to the east-end, Masinag station, along Marcos Highway in Antipolo, Rizal Province. The Manila Railroad Company (now Philippine National Railways) previously has line to Montalban traversing Marikina with the main station and three flag stations in Santo Niño, Bayan-Bayanan, and Nangka, services ceased in 1936. Marikina River is the main waterway in Marikina and the main transportation is river ferries and boats. Marikina Science High School (MSHS), is the first city public science high school in Marikina. Marikina Catholic School is a private sectarian institution and it is considered as the city's center of Catholic educational institution located in Our Lady of the Abandoned Parish complex. Other sectarian schools such as Marikina Christian Integrated School, National Christian Life College and Our Lady of Perpetual Succor College (OLOPSC). Private school such as Mother of Divine Providence School, St. Nicholas School, Holy Trinity School, Charis School, Infant Jesus Academy, San Lorenzo Ruiz de Manila School, Kostka School, Ingenium School Foundation, and some exclusive schools such as Marist School and St. Scholastica's Academy are also found in the city. Marikina has sister cities and friendship agreements with foreign and local cities. ^ "Brief History of Marikina". Marikina On The Go, Marikina Science High School. Retrieved 28 February 2015. ^ "Which regions, provinces, cities are Philippines' richest?". ABS-CBN. 19 November 2015. ^ "Marikina shoemakers and retailers talk about their city and their SM | Sunday Life, Lifestyle Features, The Philippine Star". philstar.com. 17 April 2011. Retrieved 13 March 2014. ^ "Liberalization and the Value Chain Upgrading Imperative : The Case of the Marikina Footwear Industry" (PDF). Dlsu.edu.ph. Retrieved 13 March 2014. ^ "World's Largest Shoes". Atlas Obscura. Retrieved 13 March 2014. ^ "Ang Alamat ng Marikina" [The Legend of Marikina] (in Filipino). marikeno.com. 1 September 2014. Retrieved 17 May 2017. ^ "Marikina General Information". Marikenya.Com. Retrieved 13 March 2014. ^ "Railways of old in Manila and Rizal | Caught (up) in traffic". D0ctrine.com. 8 November 2011. Retrieved 13 March 2014. ^ "Marikina Airfield". Pacific Wrecks. Retrieved 13 March 2014. ^ "Republic Act No. 8223" (PDF). Philippine Congress. Archived from the original (PDF) on 12 February 2012. ^ "The Show Industry of Marikina City, Philippines : A Developing-Country Cluster in Crisis". Journals.upd.edu.ph. Retrieved 13 March 2014. ^ "Marikina City Seal | Inside Marikina". Marikinacity.wordpress.com. 1 April 2009. Retrieved 13 March 2014. ^ Carcamo, Dennis. "MMDA opens 2nd bike lane in Marikina". The Philippine Star. Philstar Global Corp. Retrieved 1 July 2018. ^ "Municipal Cooperation, 1967–present" (PDF). Brampton, Canada: Economic Development Office, Brampton City. April 2014. Archived from the original (PDF) on 15 February 2015. ^ PIO Department (6 March 2018). "Mayor of Sakai Town in Japan, Other Officials, Visit Sister City Marikina". Marikina City. Marikina City. Retrieved 1 July 2018. ^ "Alaminos donates goods in Marikina". Balita. 29 September 2009. Retrieved 20 February 2015. ^ "Bacolod send aid to Marikina". SunStar. 22 August 2013. Retrieved 20 February 2015. ^ "Iloilo sends aid to Marikina, Quezon City". Balita. 1 October 2009. Retrieved 20 February 2015. Wikimedia Commons has media related to Marikina City. Wikivoyage has a travel guide for Marikina.